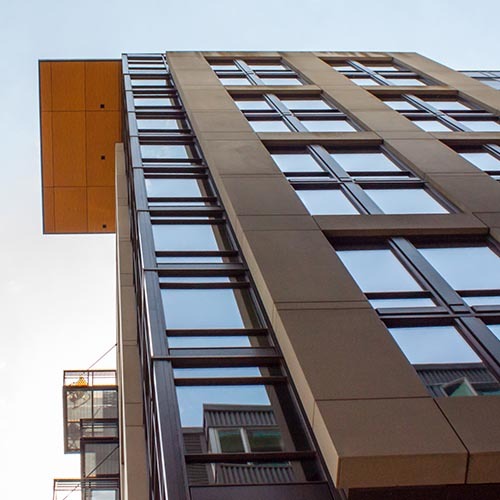 The Joseph Arnold Lofts is a design-build, 12-story apartment building. The building features PT concrete and three floors of underground parking. Auburn Mechanical worked closely with the architects, and other design consults through the design process. Of paramount concern, the parking garage would sit more than 20 feet below sea level—located on Elliot Avenue. Coordination with the general contractor was essential to ensure below-slab piping, vaults and penetrations were to be watertight. The 3D MEP coordination allowed the team to “fly through” the partitioned sections of the slab where vaults and the 30,000-gallon stormwater retention tank were segmented from the slab and enclosed in formed, waterproofed concrete.